This book has been sealed in a cellophane sleeve for protection. This book has little to no wear on it. Make: Jackill. Year manufactured: 1993. I am easily accessible and do my best to respond as quickly as possible. A complete set of 12 Fotonovels. Bantam book paperback. Age appropriate shelf wear on covers with small tear at top of spine and crease along spine, yellowing along spine. NUMBER ONE. MARCH, 2280, TERRANGLO EDITION. SEATTLE TO BE EXACT. EVERYTHING THAT HAS PASSED THROUGH THE HANDS OF MANKIND, OR THE SOILS OF THIS PLANET, HAS ITS' OWN UNIQUE STORY, AND SOUL. IT MAY BE AN OLD 45 THAT WAS CRACKLING ON A TURNTABLE DURING THE BEATNIK GENERATION OF THE 1950'S. Magazine only, no models included. 50 pages, A5 format paperback. Limited edition. I try to get back to you within 12 hours. WITH BINDER. BINDER HAS A LITTLE SHELF WEAR. OFFICIAL FACT FILES. FACT FILES MAGAZINES. WITH INDEX. MAGAZINES ARE IN VERY GOOD CONDITION. R&R Issue #16 fanzine. Wear as shown. Forum #8 Fanzine. Light wear. Star Trek Fanzine Interstat #57. Light wear. Both the model and magazine are in good condition. You will receive all magazines shown. Magazines are in overall good condition with minimal creasing and are completely intact. Please feel free to contact me with any questions. 25th and 30th anniversary magazines are near mint condition. Coloring book has a few pages completed the majority is not. Chronology book has some slight wear to spine. Set Of 2 beautiful leather bound 14k gold lettering books. 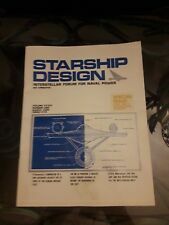 1st Book “Star Trek The Complete Unauthorized History By Robert Greenberger. Published 2012 Voyageur. Great color pictures total of 256 pages and near mint condition. HEAVY ALMOST 5 LBS BINDER WITH PAGES. BY NEWFIELD PUBLICATIONS. FACTS AND PICTURES FROM EARLY CLASSIC STAR TREK TV SHOW TO 1997 STAR TREK SHOWS. 100'S OF GLOSSY PAGES. BEHIND THE SCENES, CHARACTERS TRIVIA, EPISODES. OFFICIAL BOOK. TECHNICAL MANUAL. TRAINING COMMAND. Jay Chattaway. Star Trek Voyager The Official Magazine Issue #4 from October 1995, published by Starlog. In used but good condition, there is slight wear at the edges. You will receive all three volume shown. Each book is in overall good condition for age with little to no creasing and soiling. 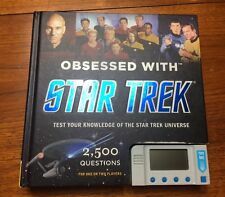 This is a great reference for any new or experience Star Trek or science fiction collector. This is the 10 of the 12 issues of 2000 Star Trek The Magazine. January to December issues missing Issues 11 March and 14 June but Incudes both different cover issues from October for a total of 11 magazines. This is the first 7 of 8 issues of 1999 Star Trek The Magazine. May to December issues missing Issue 5 September. Incudes the Premier First Issue. Beautiful High quality magazine with foldouts. HERE IS ONE LOT OF STARLOG MAGAZINES. THIS LOT CONTAINS ISSUES 167-200, INCLUDING THE SPECIAL 200TH ISSUE. ALL HAVE BEEN IN STORAGE AND NOT IN CIRCULATION. ALL ISSUES ARE IN SLEEVES AND PADDED. 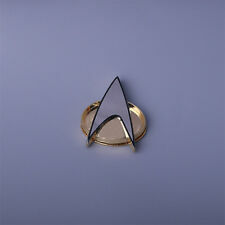 You are buying 7 pieces of Star Trek collectible book and blue prints. The books are 1 comic, Star Trek the Evictors the Choice condition good, 1 the Best of Star Trek condition very good. 1 Star Trek Tests of Courage condition like new. Special Features: In depth information into everything Star Trek for the anniversary celebrations. Publication Date: 1991 and 1996 (The date in the title refers to the year the title started). Special Notes: These issues are all first printings! Lot of five Pocket Books paperback Star Trek books. Lot includes -Star Trek: The Next Generation Technical Manual (1991). -Star Trek: The Next Generation: 20th Century Computers And How They Worked (1993). HERE IS ONE LOT OF STARLOG MAGAZINES. THIS LOT CONTAINS ISSUES 201-258. INCLUDES SPECIAL 20TH ANNIVERSARY ISSUE. ALSO INCLUDES ISSUES #32 & 112. ALL HAVE BEEN IN STORAGE AND NOT IN CIRCULATION. ALL ISSUES ARE IN SLEEVES AND PADDED. These are the perfect Star Trek magazines for all Star Trek Collectors and Trekkies. These magazines were issued between May 1999 and April 2003 when production stopped. Star Trek The Magazine. Lot of 6 Magazines.